amoxicillin over the counter Deer Valley’s dining scene has long been a huge bonus for visitors alongside its pristine skiing. 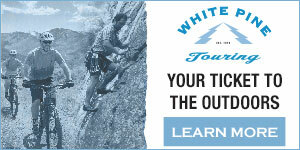 It is also an extremely large part of the picture in terms of the experience that one receives while skiing there. Each restaurant and lodge offers something a bit different, while also keeping things under the umbrella of Deer Valley’s iconic comfort food. The resort’s newest addition, The Brass Tag, is becoming one of its most unique players, and we recently had the pleasure of learning more about their fantastic apres and cocktail scene. When the ski lodges close up, the shade begins to cover the runs, and the skiers begin to trickle down the mountain, The Brass Tag is the perfect place to end up after a long day of pristine skiing conditions. 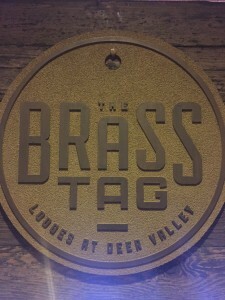 Located less than half mile from the base of Deer Valley Resort at The Lodges, The Brass Tag features Deer Valley-inspired comfort food, while specializing in brick oven cuisine. An amazing spot to grab dinner as well, we really wanted to shine some light on their delicious apres menu and breathe life into their strong craft cocktail program. They’re the only ones doing a sit-down, operated bar like this at Deer Valley after all. The first thing one will probably notice is the distinctive appearance to their bar top. The interesting series of lines, numbers and names all in fact make up a map of the mining claims from Park City’s mining days. The Brass Tag’s name in it of itself is derived from the brass tags that miners used to hang on a wooden board before entering the mine, and take when they exited. With the mining claims map, you will also be able to see actual brass tags within the bar top. Like the runs at Deer Valley, the drinks here are also named after something significantly related to the mining times of Park City. While sitting at the bar, don’t be surprised if you look down and notice that the drink you are enjoying happens to be printed on the map that it’s sitting atop. Say hello to spring with The Stargazer, one of their inventive signature cocktails that uses local ingredients, as well as freshly squeezed fruit juice. 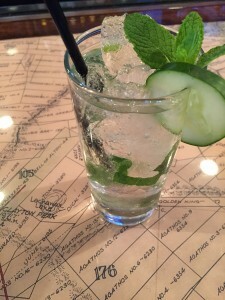 Salt City Vodka, fresh lime juice, muddled cucumber and mint, topped with soda water. So refreshing. The Square Deal, whose name reflects the large square ice cube it is served with, is a warming combination of Drambuie Liquer; an extraordinary blend of aged Scotch whiskey, heather honey, spices and herbs, topped with Australian ginger beer and garnished with fresh orange. See the featured image at the top of the page to see the cocktail itself! Finally, there’s the lovely Evangeline. 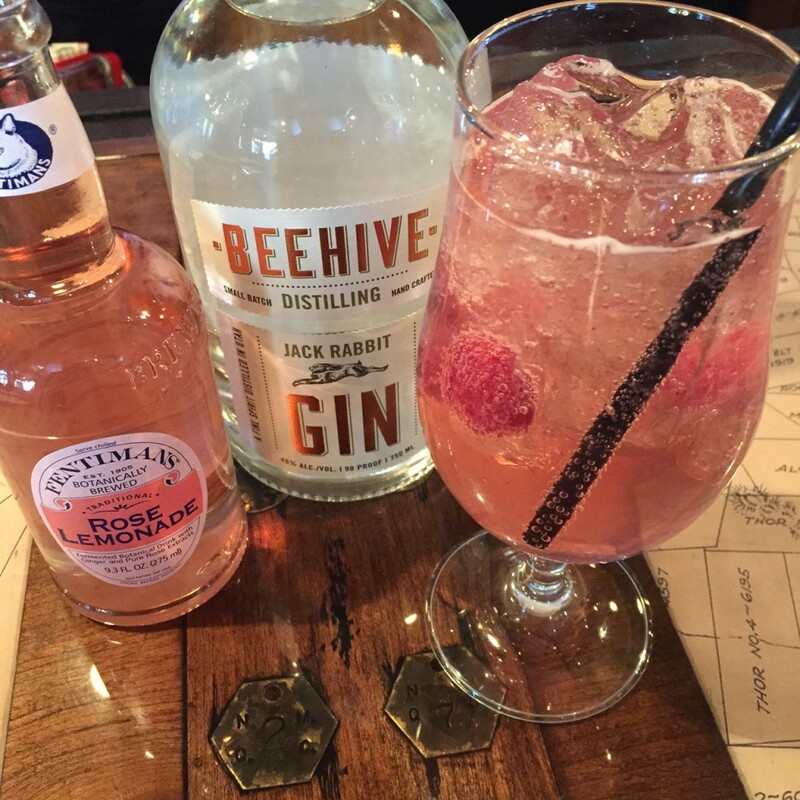 Local Beehive gin, fresh lemon juice, house lavender infused local honey and rose lemonade. 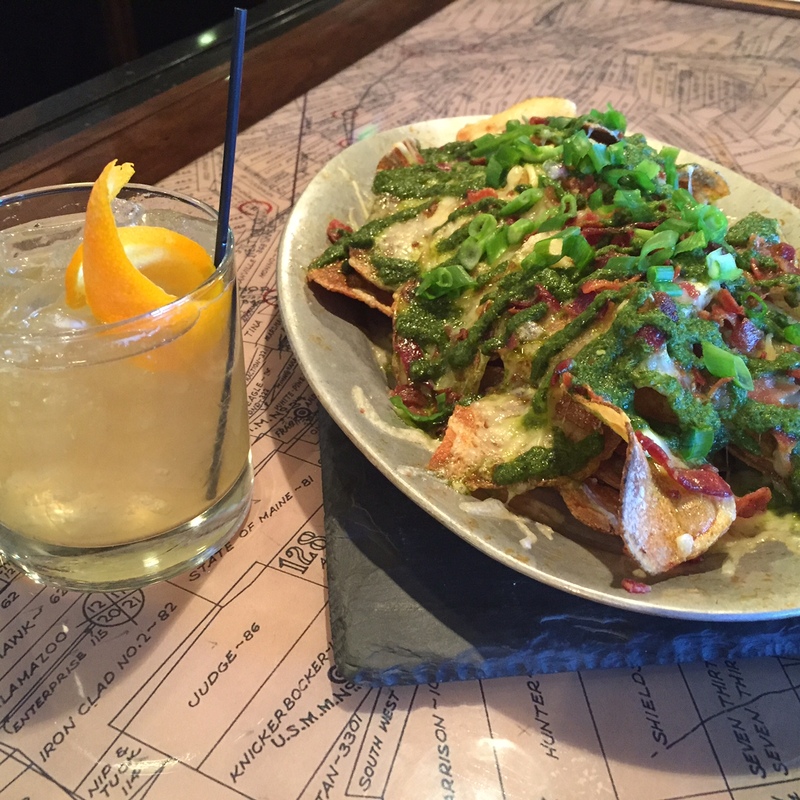 I know, it sounds ridiculously good so bar manager Josh Hockman provided us with the recipe. In a shaker, add gin, lemon juice, honey and shake until chilled. Now of course we need something to munch on alongside our delicious cocktails, now don’t we? They’ve got us covered. If you’re in the know, you’re aware by now that Deer Valley has an amazing cheese making program. Make sure you tune in when our summer/fall issue comes out as we will be doing a large feature on the entire production! With that said, it is some damn delicious cheese. 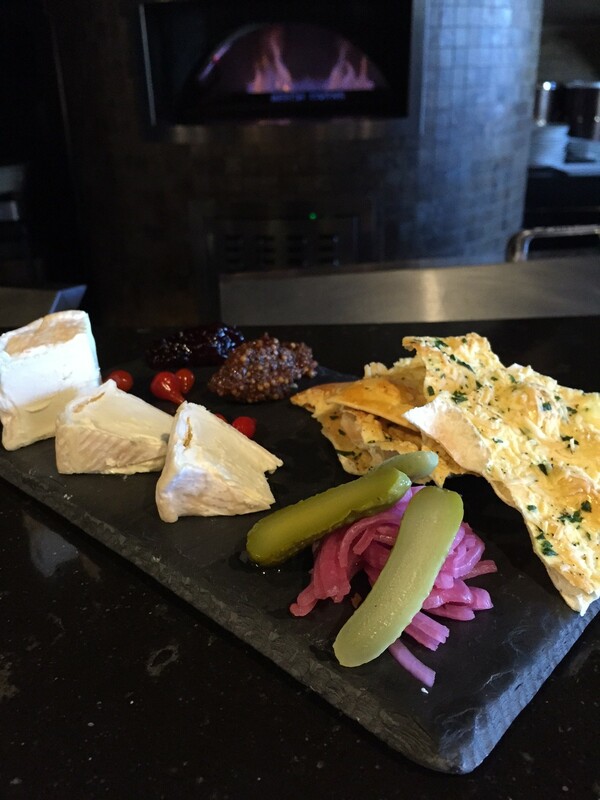 At The Brass Tag, enjoy a lovely cheese plate made up of Deer Valley’s own Meadlowlark, double cream brie cheese, house pickled onions, whole grain fig mustard, foraged elderberry jelly and house made crackers. A pretty perfect cheese plate I must say. Then there’s the famous Chimichurri Chips. For being a newer restaurant, it’s pretty amazing how much I’ve heard people talk about these. Now, I 100 percent know why. They are not just nachos. Oh no. They are nachos taken to a new level. They taste fresh, homemade, and so comforting after a day of skiing. 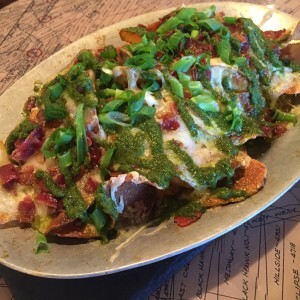 It doesn’t get much better than homemade potato chips, local Gold Creek Farms cheddar cheese, bacon, and freshly made, bright chimichurri sauce. You did it again DV. These are to die for. 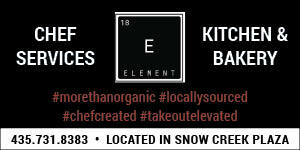 See the rest of the apres menu here. When to go? 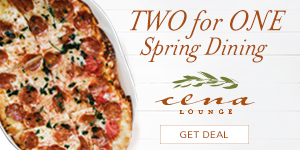 Enjoy the special Apres menu from 3-5 p.m, with dinner served from 5:30-9 p.m. and cocktails and bar offerings available until 10 p.m. 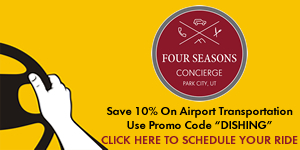 Perfect for those who like to elongate their apres into an entire night of an experience. Yes, we’re highlighting their apres and cocktails, but their dinners are not to be overlooked. 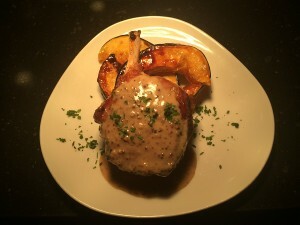 Their Niman Ranch pork chop was just named the No. 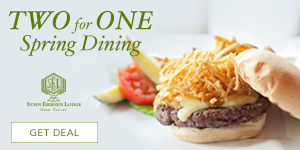 1 on-bone meat option in Utah by the Salt Lake Tribune. Honestly, it’s all amazing. 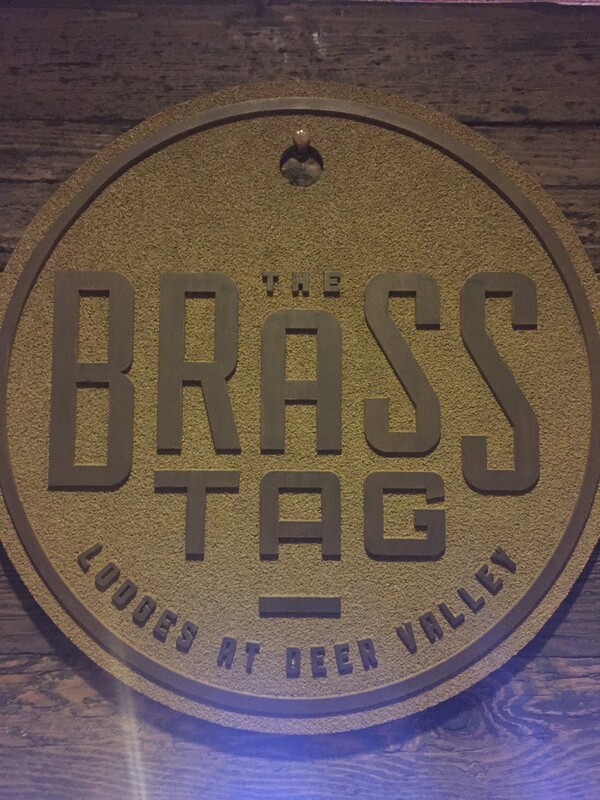 A restaurant that definitely stands out in the grand scheme of things within all of the Deer Valley restaurants, make sure you head to The Brass Tag to check out all of their menus! The last day to apres will be April 12th, but don’t worry, they are open all year round and it is the perfect place to end the day after hitting the hills on a bike as well.